Year 1937. The battle lines were laid out in Detroit. The state of the unions was not good, but labor’s line in the sand was clearly marked. Motor City is where blue collar sweat left the age of horse and buggy far behind in the dust of nostalgia. Automotive workers labored at a furious pace to put the world on wheels. Assembly line workers crafted those infernal internal combustion machines made of Great Lakes steel. A novelty at first with just enough juice to get you across town. But as technology grew, motoring matured. Engines made in Detroit would soon have enough horsepower to drive a nation. Cars were growing more powerful every day, while the workers were pinned under the heel of industrialists who grew rich and fat on the fruits of their labor. Henry Ford in particular was the poster child of anti-unionism in the heady days of strikes and strife, preferring profits over workers’ rights. Henry Ford was the self-proclaimed potentate of his manufacturing kingdom, demanding tribute in the form of labor and loyalty from his machine-age minions. He ruled with a “let them eat cake” mentality that left him oblivious to the gathering storm clouds that were forming among the workers of the monolithic Ford Rouge Plant in May of 1937. Ford had thousands of toiling workers at the complex, which at the time was the techno-Taj Majal of all factories. Modern and monstrous, it was imposing and intimidating as the castle of the Black Knight. When you drive by it today, it still overwhelms the senses with its sheer size and bulk. Rouge was referred to in hushed tones by Ford workers as the “butcher house.” But soon this bastion of Ford’s reign of terror was about to be confronted by the United Auto Workers of America (UAW), as they set the wheels in motion to break Ford’s blockade of unionism. Events would lead to a confrontation resulting in a public relations nightmare of outrage over the violent tactics Henry Ford authorized to put down the revolt. The labor storm that broke loose at the Rouge Plant produced a torrential flood of blood and vicious violence when his lordship Henry Ford decided to unleash the Ford private security forces on union leaders. These included Walter Reuther, who at the end of the day was beaten bloody by Ford’s goon squad that could have given lessons in brutality to Hitler’s Gestapo. To understand the Battle of the Overpass, as it became known, we have to look at the Diego Rivera industrial landscape of 1937 Detroit. It was as blue-collar as it gets. Assembly line unionism and emerging socialism had begun to work together making inroads for the common good of the working class of the city’s auto plants. Two of the Big Three, GM and Chrysler, were already under the union banner, but there was still a long way to go at the Ford Motor Company. The monotony of the assembly lines was numbing, the high-decibel noise of the factories was deafening, and the wages were low. The Yellow Brick Road led to Detroit, Emerald City of the Working Class, but instead of finding delightful Munchkins and a colorful Wizard, you entered a land blanketed with a thick veneer of pollution from belching smokestacks, along with a heavy haze of Detroit dust and rust that gave Motor City sunsets a burnt orange hue. These factories held the workers in a tight headlock of red-hot steel and iron, as they slaved furiously to place product in the automobile showrooms of America. As the horse-powered highway machines rolled off the line, the blue collars, proud of their red-white-and-blue product, were getting restless. Day in and day out, they emptied their black lunch boxes of five-hour-old sandwiches, hard cheese, tomatoes and proscuitto, washing it all down with a quick drink from a silver thermos. They were an autoworker audience waiting for the labor drama to begin. The hardhats of Detroit lived and worked in a town without blue collar pity, while the Big Three industrialists, fueled by greed, drove them relentlessly. Fordism was creating discontent, discord, and dissent among the ranks. The workers had reached a breaking point, and the forces of solidarity were hard at work. It was just a matter of time before the two sides would meet in mortal combat. No one could have predicted an explosion of violence. Henry Ford was anti-union. He did all in his power to keep his factory union-free. In an effort to diffuse any attempts he went so far as to set up a fake union called the Knights of Dearborn, which was not a union at all. It was Ford’s smoke-and-mirrors magic act. The Knights newspaper and newsletter were locked and loaded with anti-Jewish messages spreading Ford’s gospel of anti-Semitism. He also instituted the $5 day for his workers to keep the union out, which worked for a few years. The initial attempt to unionize Ford workers occurred in 1913, the golden year of the Tin Lizzie. Ford’s profit margin rocketed as the company cranked out Model T’s by the thousands. Unfortunately, this amazing success was not putting larger paychecks in the workers’ pockets or food on their tables. Profit sharing, bonuses, and increased wages were not in Henry Ford’s vocabulary. By 1915 Ford was so rich he was having a huge mansion built in Dearborn, Michigan, called Fairlane, which still stands today. It was a nature center of massive proportions, absorbing property like an angry sponge. It included a waterfall built on the Rouge River. The area was designed by Jens Jensen with costs that ran to $370,000 for landscaping alone! He also made sure he had 500 birdhouses installed, a massive greenhouse for his wife’s horticultural hobby, and a miniature house built for his kids to play in. The workers were underpaid and overworked, so Ford could funnel funds and profits into his various personal projects. While the assembly lines ran non-stop, and life and poverty droned on for the workers on the floor trying to feed and house their families, Ford dined on steak with the likes of Harvey Firestone at Fairlane. The king had raised the drawbridge to protect his capitalist castle, but outside, forces were now at work; by the 1930s the union was prepared to cross the moat and storm the citadel. The UAW campaign of 1937 involved a “Unionism not Fordism” approach, with a frontal attack using weapons of mass industrial destruction – leaflets! Pieces of paper to be passed out to workers coming and going from the belly of the Ford Rouge beast at the pedestrian overpass on Miller Road in Dearborn at Gate 4. Remember Ford’s $5 day? By this time Ford workers were getting six bucks for an eight-hour day. The UAW leaflets said the union would fight for an eight-dollar, six-hour day, but they had to unionize and fight as one. Unity and safety in numbers: United we stand, divided we fall! The campaign to emancipate the wage slaves of Ford was about to begin. The Battle of the Overpass would be its turning point. By the beginning of 1937, the Reuther brothers of the UAW – Walter, Victor, and Roy – had a plan, but they had to get all their industrial ducks in a row before the assault on Ford could begin in earnest. To start, the UAW targeted the other auto manufacturers, modeling their strikes after their European counterparts who engaged in sit-down strikes and refused to work or budge. First the UAW struck one of the major auto suppliers in town, Kelsey-Hayes, and scored a victory on that front. The next target was set for the GM Fisher plant in Flint, Michigan that resulted in a battle that lasted over three hours where gas and buckshot were fired at the strikers. With workers now shot and wounded in pitched battle, the workers counterattacked with factory hoses and monster slingshots that could launch up to two pounds of heavy metal at the police and strike breakers. Blood flowed on both sides. Then in February, the UAW targeted the Flint Chevy plants. GM capitulated and signed a contract with the victorious UAW. The Reuther brothers were on a roll. As the Ides of March approached, some 200,000 workers staged a huge sit-in protest that also brought out the white flag of surrender by Chrysler, Studebaker, and Cadillac. The little union that could was not just victorious, but had grown in power and numbers. Walter Reuther’s local, which at first numbered a mere 78 card-carrying union members, could now boast of a membership of over 30,000. 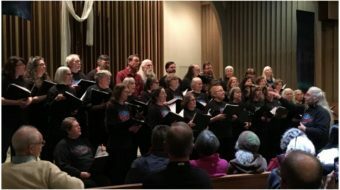 The UAW had won a set hourly minimum wage, set up grievance committees, established seniority policies, abolished piecework pay, and now had a unified voice that would no longer be silent. The UAW was riding the crest of success. Just before the attack on Ford was to begin, Walter Reuther decided to hold a rally in downtown Detroit to speak to all unions and all union members no matter what field they came from. Meat packing plants, laundries, hotels, and other businesses in the Motor City were all represented, and all turned out for the rally. Reuther spoke to a throng of over 150,000 at Cadillac Square, calling for Labor party candidates to run for city offices, and crying to rid Detroit of corrupt police and city officials. The fiery speeches had an impact. Most important, the UAW was now firmly established and in a position to launch an assault on Henry Ford. The workers in the Rouge plant held secret meetings to discuss joining the UAW and to plan for the upcoming protest at Gate 4 of the Miller Road Overpass. Reuther meanwhile obtained his license to demonstrate from the city hall in Dearborn, as corrupt a city if ever there was, opened two union halls, and made a couple of forays to the Overpass to scout out and plan the logistics. Knowing that the union organizers might be sitting ducks for Ford’s Gestapo, he extended a welcome for others to join the UAW in the march, including clergymen, reporters and journalists, along with members of the Senate Committee on Civil Liberties. One hundred women, members of the Women’s Auxiliary of the local, were to help distribute the leaflets. (Later, during the battle, the women arriving by trolley cars were shoved and beaten by Ford Security Forces. The Dearborn police stood by doing nothing to prevent the carnage. One cop did yell out as Security Forces were beating a woman, calling for them to stop, as they would kill her if they kept it up. Other cops told him, as related in a later interview, to “Stay out of it – Ford was only protecting his property!”) Two hours before the battle began, two dozen carloads of Ford goons wearing sunglasses arrived, warned the union to move on, and also started to shove the photographers around. Then it calmed down. But soon all hell broke loose. It began with a simple click of the camera that was not exactly the ideal Kodak moment for Ford. Those images captured became the “shots” heard ’round the labor world! At 2 p.m. on the afternoon of May 26, Walter Reuther and other UAW organizers were passing out leaflets on the Overpass when a photojournalist from the Detroit News asked them to pose for a front-page photo on the Overpass itself with the Ford signage on the Rouge Plant for a backdrop. This photo would have a clear labor message. But what happened next made the message even clearer, and for Ford, resulted in a PR disaster for the automaker worldwide. The workers’ power of the people combined with the power of the press were a deadly combination that day that delivered a political black-eye to the industrial demagogue of Detroit – along with very real black eyes and injuries to Reuther and other labor leaders who suffered severe beatings from attacks by Ford’s internal security forces. They attacked as a pack of mad dogs rabid for revenge, flying into a rampage and beating frenzy. According to newspaper accounts, these few men of the UAW, alone and defenseless, were attacked by as many as three dozen Ford thugs with fists, punches, kicks, and clubs. It was the beginning of the end of Fordism, and rise of the union in the Ford factories. In an interview in the Detroit News after the beatings, Reuther explained what happened. “Seven times they raised me off the concrete and slammed me down on it. They pinned my arms…and I was punched and kicked and dragged by my feet to the stairway, thrown down the first flight of steps, picked up, slammed down on the platform and kicked down the second flight. On the ground they beat and kicked me some more.” Many of the other organizers were also beaten severely, and one got a broken back out of the ordeal. The press was attacked as well, including the Detroit News photojournalist. The security forces tried to destroy all photographic plates of every photographer on hand. But the Detroit News photographer hid his plates under the backseat. When security forces cornered him at his car after a chase he reached in the front seat and handed over blank plates which they smashed on the ground. The photographer and the “real” plates made it in time to stop the presses at the Detroit News plant in Downtown. The story of the Battle of the Overpass and the photos he had taken made front page in newspapers across the country! Ford’s reputation was irreparably damaged for years. 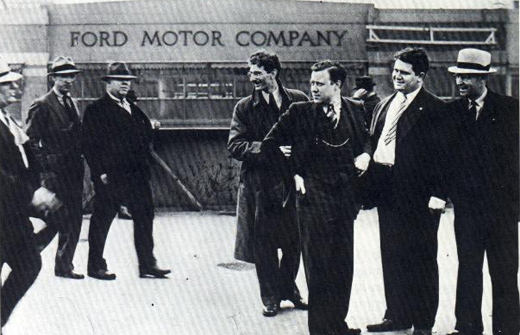 The door blocking the union from Ford’s factories was blown off its hinges. 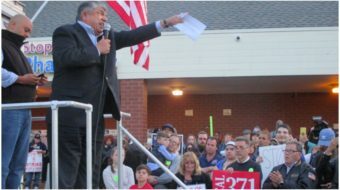 The National Labor Relations Board also took Ford and his security officer Harry Bennett to task and publicly chastised them. On June 20, 1941, Ford finally gave in and signed a contract with the UAW. The man who put the world on wheels had lost the union battle. Now he lost the battle of life at the hands of his own mansion built on the blood and sweat of his workers. In the end, Unionism did win over Fordism and ushered in a new era of workers’ rights.